MEMPHIS, Tenn. – April 1, 2019 – Ducks Unlimited has released the latest film in its online series. 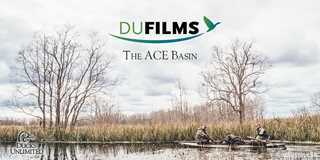 In “The ACE Basin” viewers are treated to a hunt in South Carolina and interviews with some of the key people behind conserving the ACE Basin. ACE stands for the Ashepoo, Combahee and Edisto rivers and the lands surrounding them. In 1988, Ducks Unlimited, The Nature Conservancy, the South Carolina Department of Natural Resources and the US Fish and Wildlife Service teamed up to form the ACE Basin Task Force, a partnership that has produced conservation easements on 217,000 acres. Each of the film’s participants has spent decades conserving habitat. Coy Johnston is one of the focal points of the film. His roots in Ducks Unlimited run deep, beginning as a South Carolina regional director in 1979. He became east regional director in 1987 and project director of the Lowcountry Initiative of Ducks Unlimited’s Wetlands America Trust (WAT) in 1989. Coy eventually became WAT director and has continued the preservation fight for ACE Basin lands throughout his life. Johnston and many others in South Carolina are passionate about the land and dedicated to conservation. The 2019 season includes six films. DU will release one film per month this spring and summer.